What an extraordinary day. WARNING: it starts badly. Again. Announcements started at bang on 7am but people obviously couldn’t be bothered getting up that early, because by 8am, they were coming through the headboard speakers. We got up and went ashore just before 9. When we saw the queue, we immediately asked for a chair for mum. What turned up was not a chair, but a wheelchair, which turned out to be marvellously useful, as the port-employed pusher proceeded as far up towards the front of the queue as he could get away with. But the queue did not move. They funnelled those on excursions to the front of the queue, and we remained stationary. And we waited and we waited and we waited. After being fully fingerprinted and photographed, we finally met up with Stewart and Julie at quarter to eleven. Yes, feel free to go back and read that again, I’ll wait here. Quarter to ELEVEN. Over two and a half hours. 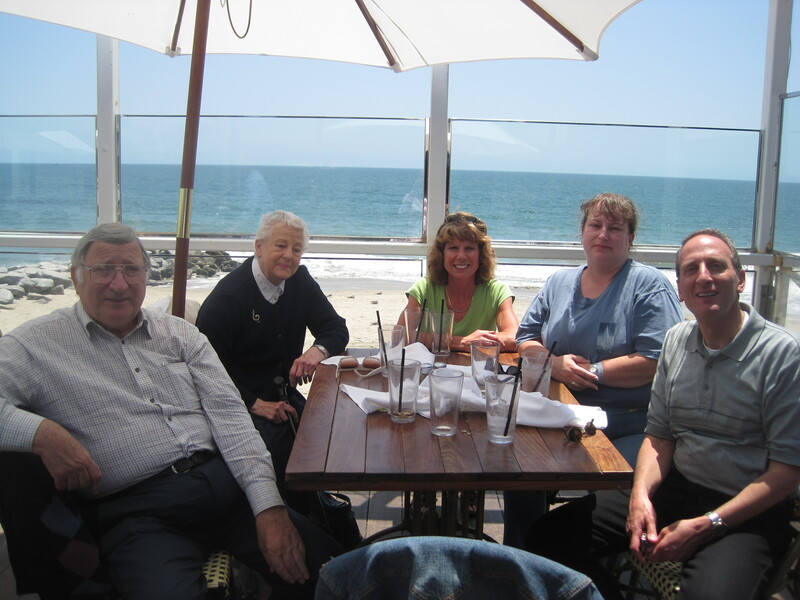 We drove to Malibu where we went to lunch at Gladstone’s, a stunning restaurant right on the Baywatch beach. 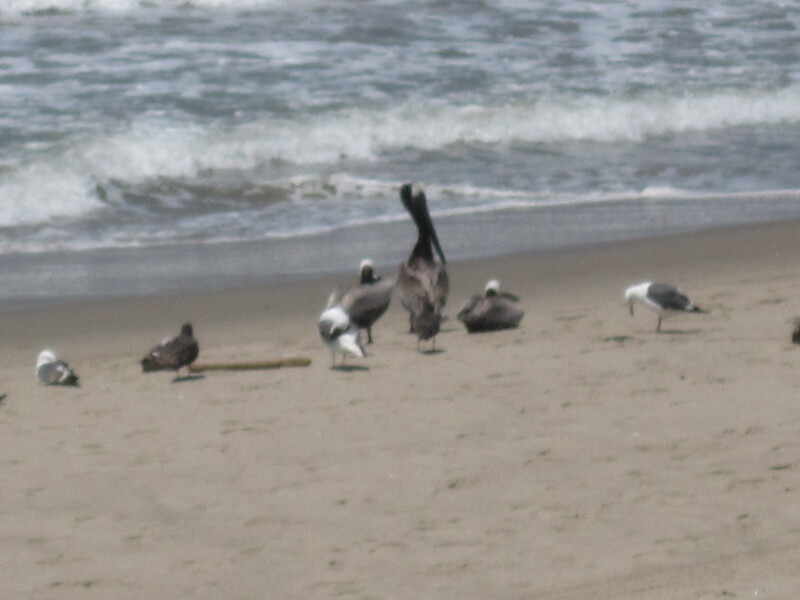 We watched the pelicans fishing while we ate. The food was superb. My chicken sandwich was served on challah bread! 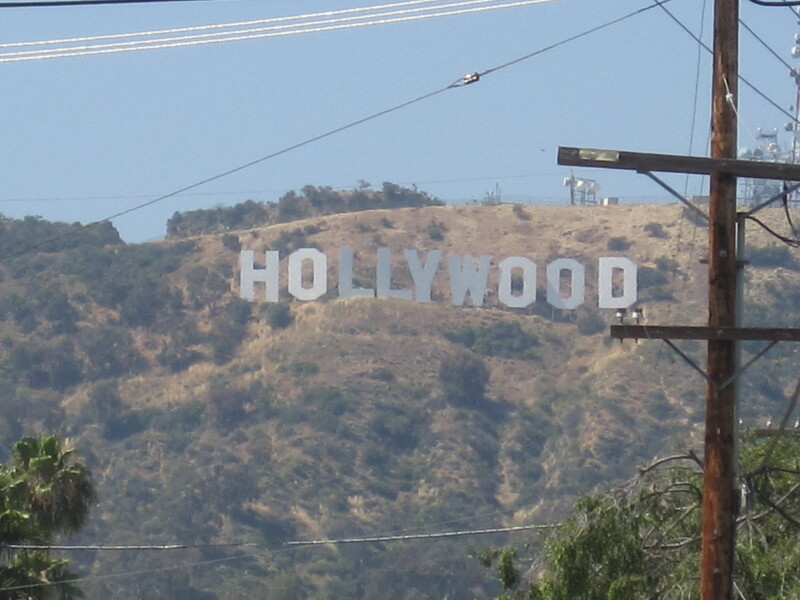 When we left, we headed into town and saw Rodeo Drive, Grauman’s Chinese Theatre, the Walk of Fame, the Kodak Theatre and other bits and pieces of that ilk. Stewart and Julie also found us a good spot to take photos of the Hollywood sign. We then headed back to the ship, which was completely the other end of town, over two dozen miles away through heavy traffic – rush hour here starts at 3pm – and we only got through by using the car pool lane. It only today dawned on me that the car pool lane is empty because most vehicles only contain one person. No wonder they have such pollution problems here. We went through the car pool lane (which you can only use if you have 2 or more people in your car) like a dose of salts. We arranged to meet up with mum’s cousin, Judy, and her husband, Jerry, but they had problems with the traffic and then accidentally went to the wrong place. We waited as long as we could at a little cafe village near the ship called Ports O’ Call, despite being attacked from all sides by mariachi bands parping at us much too loudly but admirably persistently, whilst still being quite astonishingly tuneless, but eventually we had to head to the terminal. Mum was quite upset and I developed a banging headache trying to navigate Jerry and Judy’s car through a town I don’t know (although I may have a bit of sunstroke as well). Jerry eventually rang and said that they were at the terminal but couldn’t find us. After much toing and froing, we realised that they were on a different car park level to us! We found them just in time to say goodbye before boarding. In fact, we were just swapping kisses when we were informed that the ship wasn’t leaving today, but tomorrow! I had to chase Stewart and Julie’s car down the road to get them to stop and come back! On the plus side, Julie gave me some Moltrin. Dunno what’s in it, but it fixed my headache, no problem. Good stuff. On return to the cabin, I found a letter from the Captain explaining what had changed. The immigration procedure apparently was not completed until 4.30pm, which meant that some had less than two hours in LA. No wonder they kicked up a stink! So we are staying another day here in LA and skipping Roatan instead, to make up the discrepancy in the itinerary. No iguanas for us then. Interestingly, the Captain blamed the slow immigration process on the behaviour of some passengers, which made the US authorities suspicious/annoyed and decide to up the requirements for everyone. Oh, and an hour-long computer crash. Right. Nothing that could be construed as pure vindictive over-officiousness by the US Homeland Security personnel then? Okay. Because a couple of mouthy passengers is plenty enough reason to force all 3000 people on board to go through a NINE AND A HALF HOUR immigration process, is it? Good to know. Say the word ‘security’ and you’re expected to just put up with whatever they feel like throwing at you. And they can throw whatever they like, you daren’t object. After all, who would argue with good security? And they are armed… Those we left still queuing had no food, no water and no toilets. Neither were they allowed back ONTO the ship until everyone had been immigrated. Goodness only knows what they went through. I have never been so glad we queue-jumped. Or so unashamed to have done so.